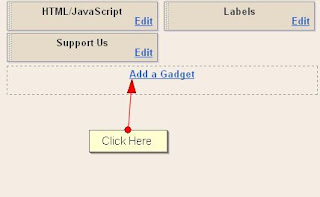 In the last post Simplest Way To Add A Recent Posts Widget To Blogger Blog I explained a very easy method to add a Recent Posts Widget to Blogger blog. 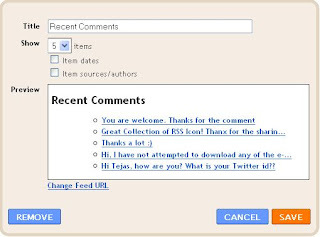 Using the same method, we can also create a Recent Comment Widget for blogspot users in a simple manner. Just follow the simple steps and add a Recent Comments widget to your blog. Click on Layout option of the blog for which you want to add the widget. Now click on Add a Gadget option. You will see a list of Gadgets. Find Feed among them and click on it. Now you will have to add your Blog Comments Feed url and click on Continue. Once you do that, you will be taken to a page where you can choose how you want to display the Recent Posts Widget. You can also choose how many comments you want to display in the widget. If you don't know the comments feed URL of your blog, then replace the blog address with your blog address in the URL given below.